Julie kissed Mark at the office Christmas party. She doesn’t seem to remember but he’s not been able to forget. What better day to jog her memory than Valentine’s Day? Calum’s found the girl of his dreams on the internet. Trouble is, he’s not been completely honest about himself. Tonight he’s meeting her for the first time but will it also be the last? Nathan’s organized his usual Anti-Valentine’s party for the office singletons. Sophie’s going - again. Though this year, if she gets her way, they might just be leaving together. One office, five lives, on the most romantic day of the year. 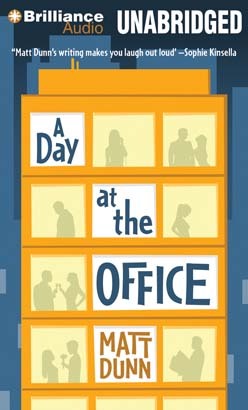 A Day at the Office is a wise, wonderfully moving, and laugh-out-loud novel about life, love, and relationships by bestselling novelist Matt Dunn.